The acronym, “BUG” (Backlight, Uplight, and Glare) was developed by the Illuminating Engineering Society (IES) and The International Dark Sky Association in order to calculate the light escaping in unwanted directions from an outdoor light fixture. In their efforts to replace the original “cutoff” system, which applied solely for street lighting, the BUG rating is a comprehensive system for all outdoor lighting. Although there are multiple variables to consider, including site, application, and how the luminaire is installed, BUG ratings serve as a measurement tool to determine the appropriate commercial outdoor lighting for certain applications. All mounted luminaries have three zones of light output. Frontlight (Glare), Backlight, and Uplight. Backlight is the 90 degree quarter-sphere located behind and below the light source. Uplight is all the light escaping above the fixture. All Uplight is inefficient and wasteful since you’re basically paying to light up the night sky. Frontlight is the 90 degree section in front and below the light source. Ideally, the light is within a 60 degree angle towards the ground. Light wider than that is considered glare and potentially harmful. You can read more about that in my earlier blog post, “What is BUG Rating.” This post is going to be a more in depth look at how the BUG rating is calculated for a fixture and what exactly the numbers mean. Before we get into the actual rating calculations, you will want to consider the zones of light. It’s important to note that these zones are separate from the Backlight, Uplight, and Glare rating even though the names are very similar. BUG rating only applies to unwanted light, so the 0-60 degrees of front light is not counted in the BUG rating. I’ll go into more details as we break out the calculations. First, we break up the three zones into sub zones by degree. The Backlight Rating (B0-5) is the highest B value from the zones Backlight High (BH), Backlight Mid (BM), and Backlight Low (BL). The chart below shows the maximum zonal lumens for each rating. For example, a light with 136 lumens in zone BH would have a B1 rating for that sub-zone. If it had 930 lumen output in zone BM and 985 lumen output in zone BL, the overall backlight rating would be B2 since that is the highest backlight value of the sub-zones. The Uplight Rating (U0-5) is the highest U value from the zones Uplight High (UH) and Uplight Low (UL). The chart below shows the maximum zonal lumens for each rating. The example is a 250-watt metal halide area luminaire, Type IV optical distribution. The bulb is housed in a covered box, so there is 0 light escaping in the UH and UL zones, meaning our example fixture has a U rating of U0. If there was light emitted in the zones, the U rating would be calculated using the table below. The Glare Rating (G0-5) is where it gets a little complicated, since both Frontlight (Glare) and Backlight sub-zones are factored into the Glare rating. Glare is the highest G value from the zones Forward light Very High (FVH), Backlight Very High (BVH), Forward light High (FH) and Backlight High (BH). The chart below shows the maximum zonal lumens for each rating. For example, a light with the following values, FVH:G1, BVH: G1, FH:G2, and BH:G0, would have an overall Glare Rating of G2 since that is the highest Glare value of the sub-zones. Compiling the zonal readings, the BUG report would read as follows, giving the luminaire a BUG rating B2 U0 G2. Although there is no requirement to include BUG ratings in specification sheets yet, it is expected that exterior lighting fixture manufacturers will employ and improve BUG ratings to prevent bad lighting practices. Feel free to leave your feedback, questions, comments, or suggestions in the comment area below. Check back on our blog or our, Facebook, Twitter, Google Plus, LinkedIn, or Pinterest for more information or innovative ideas on lighting! 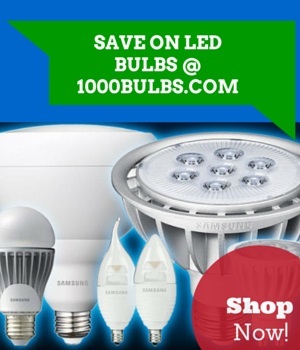 As always, our staff at 1000Bulbs.com is up for the challenge of answering your everyday lighting questions.